The annual festival (Ulsavam) of the Sabarimala Ayyappa Temple in Kerala is held during the Malayalam month of Meenam. 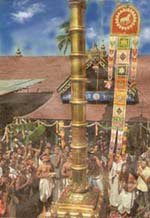 The festival commences with the Kodieyettam – hoisting of the temple flag. Devotees can have the darshan of Lord Ayyappa during the 10-day festival. In 2017, Sabarimala Ayyappa Temple Festival (dates) will be held from March 31, 2017 to April 9, 2017. The temple will open at 1730 hrs on March 31. The temple festival, Ulsavam, will begin on the same day with the Kodiyettam – hoisting of the temple flag. Arattu, the bathing of the deity, and the closing ceremony of the temple festival will be held on April 9, 2017. The temple closes on April 9, 2017. In 2017, temple will again open for Vishu Puja on April 10, 2017 to April 18, 2017. Thousands of Ayyappa devotees who like to avoid the huge rush during the Mandala Makaravilakku season (November – January) make use of the monthly puja days, Vishu Puja and the Sabarimala Ayyappa Temple Festival period. Nowadays, even these few days are attracting huge crowds. The temple is open for monthly pujas for five days from the first of Malayalam month on all months in year. It must be remembered that Sabarimala Ayyappa Temple remains closed for the majority of the period in a year.